Third seed James Blake rolled over favourite Ivan Ljubicic 6-3 6-1 to win the Thailand Open in Bangkok. Blake romped to a 5-0 lead in the first set and used his pace and powerful backhand drives to put the seal on his fourth title victory of the year. Croatian Ljubicic failed to capitalise on his trademark big serve. Scot Andy Murray and brother Jamie lost the doubles final to Israel's Andy Ram and Jonathan Erlich 6-2 2-6 10-4 on a champions' tie-break. 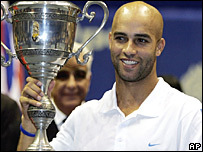 Blake, who has also won at Sydney, Las Vegas and Indianapolis in 2006, improved his chances of securing a place in the season-ending Masters Cup in Shanghai in November, moving from a provisional ranking of seventh to sixth. "I played great since and his serves were a little off," said Blake. "It's a combination of me playing well and him not playing the best through the whole match. It happens to everyone." Ljubicic said that Blake's service return was the decisve factor. "He was too good. He read my serves perfectly," said Ljubicic. "He put a lot of pressure on me. He was more relaxed and had nothing to lose. I'm disappointed. I wanted to fight but I was never there from the first point." Italy's Filippo Volandri, seeded second, defeated Nicolas Lapentti of Ecuador 5-7 6-1 6-3 to win the Sicily International in Palermo. The 25-year-old Italian number one overcame a sluggish start to claim the second title of his career in two hours and 15 minutes.